The mere thought of solving a CAPTCHA, the dreaded difficult-to-read combination of digits and letters to prove that you are a human, is extremely agonizing and frustrating for most of the internet users! No matter how much we abhor these awful CAPTCHAs, they have nevertheless become part of our routine net experiences. The term CAPTCHA was defined in the year 2000 and is an acronym for ‘Completely Automated PublicTuring test to tell Computers and Humans Apart’. 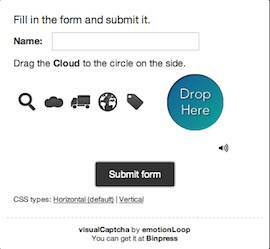 CAPTCHAs are used by websites to protect their user submitted forms (contact, comment, registration, login etc. ), online polls, forums, wikis etc. from auto submission by automated scripts, commonly known as bots. Text of CAPTCHAs is usually distorted to make it difficult for the programs to read; however, this makes it challenging even for a person having perfect vision! A study by Stanford University titled How Good the Humans are at Solving CAPTCHAS? A Large Scale Evaluation concludes that conventional CAPTCHAs that require user to identify letters/digits have an average solving time of 9.8 seconds! PlayThru is a fun alternative to the conventional CAPTCHA that requires website visitors to play a simple game like putting tools in a toolbox, matching shapes, putting aliens on a planet, matching a ball to the sports equipment etc. to prove that they are indeed humans! PlayThru has an accessibility option for the visually impaired in the form of audio CAPTCHA, with audio game development in the pipeline. VisualCaptcha is another simple drag n drop style CAPTCHA, where users are asked to drag and drop a certain item on a blank circle. Accessibility option is provided via the audio CAPTCHA where users hear a simple question like ‘How much is 6 plus 6’ and then fill the appropriate field with the correct answer. Sweet Captcha presents users with a question that is to be answered by dragging the correct answer. Multiple design categories like “fun”, food’, ‘shopping etc. are available that makes this plugin customizable. A useful feature of Sweet Captcha is localization with support for more than fifteen languages. The plugin for wordpress works with Contact Form 7 and BuddyPress plugins. Have you used any of the above solutions? How much effective did you find them?